Julia Simpson at Ocean Independence tells me that Stephanie Archer's central listing, the 26.96m motor yacht Spirit of Zen is available for charter during the Abu Dhabi Grand Prix from November 11th to 13th 2011. 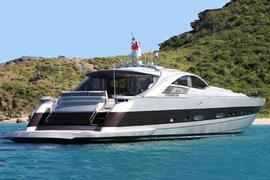 Launched in 2002, she's one of the Pershing 88 range. Her contemporary interior is a warm mix of cherry wood panelling and cream leather upholstery, accommodating 8 guests in 4 well appointed cabins. Powered by Arneson twin surface drives this perfomance superyacht cruises at 35 knots and has a top speed of 44 knots. Spirit of Zen can also welcome 24 day guests and is available at €31,250 per week. Spirit of Zen is listed for sale on boatinternational.com by Ocean Independence asking €2.5 million.